Dota has been one of the most famous games, players have loved to spend hours spending on and one of the most watched e-sports gaming event in the world. 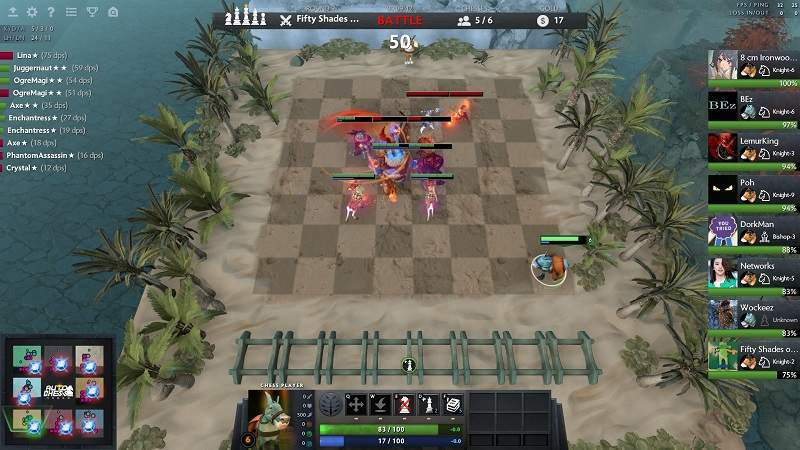 Dota Auto Chess has been storming the community in the last ten days since it was first released and already has over 15% of the game’s concurrent users in the arena. It has proven to get more attention than Artifact which was the official alternate. You still need the expertise of regular Dota 2 games but without the dexterity. Up to 8 players can play this mod, where everyone has an 8×8 board to place their units from Dota 2. You will still need gold in order to play it and you can only get by grinding and getting good at it. Once everyone has their units on board, the round starts by fighting among themselves which limits the input of the player and when the round is over you might get some gold and a random pool of units you can buy. Repeat as you get more and more gold, stronger units and a higher unit cap. You can also take part in the rock, paper, scissors way in which units interact, items, unit upgrades, which form the basis of it. According to the mod’s page, a team of five people worked on this and more than seven hundred thousand players have tried it, which goes to show the immense popularity this mode is getting. It has already been patched several times in an attempt to balance a few issues which shows the dedication of the mod team presenting the new mode to the public. We’re expecting microtransaction soon will be introduced but it is still not clear what the future holds.